The Remember Them: Champions for Humanity Monument stands proudly in the new Henry J. Kaiser Memorial Park, in downtown Oakland California. The completion and unveiling ceremony will be held May 31st, 2013 at 3 p.m.. 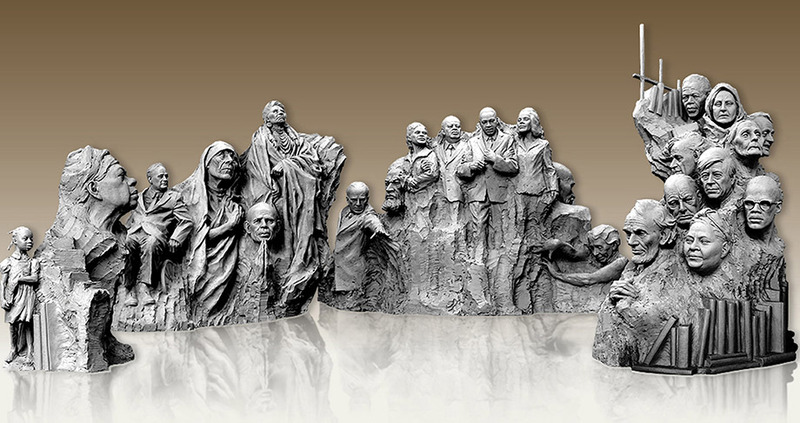 This inspiring larger than life bronze sculpture depicts 25 culturally diverse role models who have made significant contributions toward global peace, freedom and human rights over the past 150 years. See a list of the 25 humanitarians honored on Remember Them below. The Monument has been designed in four sections, cast in 60,000 pounds of bronze and will stand 31 feet high and 52 feet long. Sculptor Mario Chiodo, of Oakland California, has donated the design and sculpturing time. While the inspiration for this Monument existed for many years in the Sculptor’s mind, the impetus for the initiation of this work of art was the events of 9/11/2001. A New York City Fire Fighter was added to the fourth and final section of the monument in 2011 as a symbol of courage and dedication, and the City of New York provided a piece of the charred rubble to be included as a lasting reminder of this tragic human event, which was interred inside the fourth section of the Monument. Remember Them is an epic undertaking for many reasons beyond its sheer scale – it is the first time international Champions have been depicted together in a single monument and dedicated to all of Humanity. Another “first” is the visually impaired wall, which allows those with sight impairments to explore the characters on the monument through touch. Bronze castings of each Champion will be mounted on granite walls, along with well-known quotations from each in Braille and large imprint. The Monument includes the likenesses of fourteen interlocking figures on the backside who represent local individuals characterized as champions. See a list of the Remember Them Local Champions below. Remember Them: Champions for Humanity is a breathtaking addition to the public art of the San Francisco Bay Area, and additionally serves as an educational landmark for students and adults alike, a poignant reminder of the power we each possess to make positive change.